Your copy of Terrain Navigator Pro does not appear to be registered properly on this PC. Please contact MyTopo at 800-627-7236 or tnp@mytopo.com to correct this issue. 1. Start Terrain Navigator Pro. Click through any warnings about the registration then open a topographic map. 2. Open the File menu and choose Preferences, Subscription and User Account. 4. Enter your Username and the password that you specified when you installed version 10 of TNP. Press OK. If you have forgotten your Username, please contact us at tnp@mytopo.com or 800-627-7236. 5. Press Yes on the warning about changing the user account. Since you are not currently logged in as any user, it does not apply. 6. 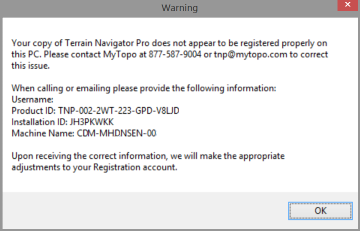 Restart Terrain Navigator Pro and your registration should be successful. My Username is filled in on this message and in the Subscription and User Account preference. In TNP open the File menu and choose Preferences, Subscription and User Account. Here note your Username, Password, and Product IDs. Use the same username and password specified in Subscription and User Account. If you are unable to login to terrainnavigator.com, please contact us at 800-627-7236 to reset your username and/or password. When calling, please have your Product ID. Note: The login at TerrainNavigator.com accepts both the username or the email address on the account. The login within the Terrain Navigator Pro desktop software employs the username exclusively - which may or may not actually be the same as the email address on the account. If you are able to log into TerrainNavigator.com with your email address, ensure that the username on the account - which is displayed in the Users section of the admin page - is also employed in the TNP desktop under File, Preferences, Subscription and User Account. Press Change Login to adjust the username in the TNP desktop software to match the username (and not the email address) as displayed at TerrainNavigator.com. I am receiving this warning when I do not have an Internet connection. Why is that and can it be suppressed? To suppress this warning when you want to use TNP offline for an extended period, open the File menu and choose Preferences, Internet Access and Map Cache, and deselect the option to Allow Terrain Navigator to connect to the Internet. I am able to log into terrainnavigator.com with my Username and password. My IT department has also verified that terpro.exe has full access to terrainnavigator.com. What now? Please contact us at TNPsupport@trimble.com or 800-627-7236. When calling or emailing, please provide the Username, Product ID, Installation ID, and Machine Name indicated in the warning message. Most helpful is to email us and include a screen shot of the window: File, Preferences, Subscription and User Account. I am running an older (pre-version 10) version of Terrain Navigator Pro. How do I disable its registration warnings?